I love this term. It was first coined by Tait Coles (@TotallyWired77) in 2011. 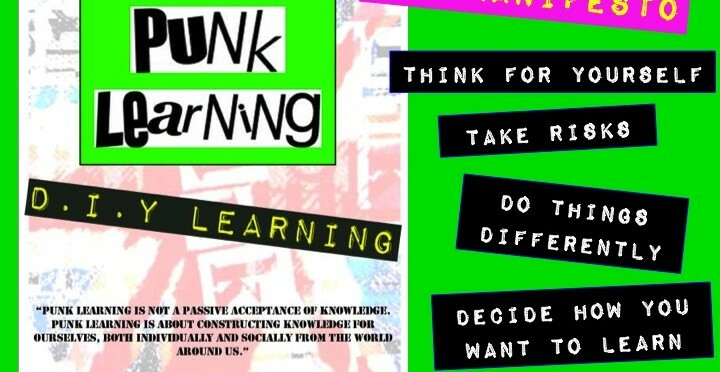 Punk Learning means many different things to different people. To me, I can summarize it with one statement – Put the kids first. Don’t let data drive your instruction. Don’t let policies you disagree with interfere with your student’s learning. Don’t talk at them for 40 minutes and expect them to listen. Don’t stress about the powers beyond and what they think of your classroom. Instead, create a culture of DIY learning. A place where interests spark creativity. A place where curiosity drives collaboration. In the brave new world of the corporate classroom where we have to teach by rote so that the children can learn in a similar manner, it is easy to run scared of the powers that be and teach in a safe, predictable way. Well, you know what? Stuff the system, stuff the ‘teaching by numbers’ rulebook and, yes, stuff the inspectors. Stick it to the Man by creating memorable teaching and learning experiences, putting children at the heart of all you do and making every lesson a quiet riot. And take inspiration from this book written by a successful teacher who is doing just that. As Sid Vicious said, ‘Cause as much chaos and disruption as possible but don’t let them take you ALIVE’. Tait’s book will be released this spring. You can find information on it here.